Capsule Summary: While the 4077th suffers through a water shortage, Father Mulcahy worries a nurse has developed feelings for him. This is a rare episode where the “Nurse of the Week” isn’t just a random member of the 4077th nursing staff never seen or heard from again. We actually get a lot of background on Lt. Gail Harris: she resigned her commission, transferred to the 4077th recently, has only seven weeks left in the military, and plans to become a doctor. 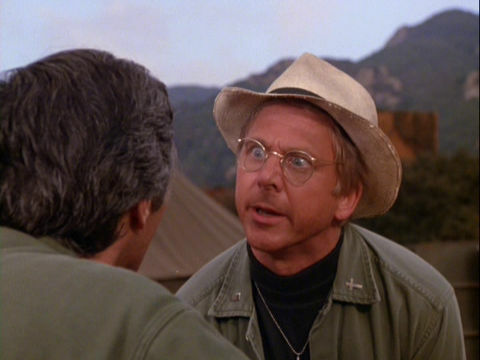 Here’s my issue with the A Story: aside from the hug that admittedly lingered a bit too long, we never really get any indication that Lt. Harris actually has romantic feelings for Father Mulcahy. She does say “I guess I care more than I thought” after Mulcahy squirms out of the embrace but that could be nothing more than simple embarrassment. She later apparently tells Colonel Potter that she had “an unhappy love affair” with Mulcahy, which is at best a wild exaggeration. Perhaps she’s a pathological liar in addition to an overeager corrector who feels everyone is out to get her. Are we really supposed to believe that Father Mulcahy never had to deal with a situation like this before? Rather than acting like an adult and simply talking things through with Lt. Harris he runs to Hawkeye, gets upset when Hawkeye is a little amused, and things spiral out of control from there, culminating in Colonel Potter’s hilarious speech. We learn from Lt. Harris that all of the other nurses think she’s a traitor because she’s resigning her commission to become a doctor and Nurse Kellye derisively refers to her as “nurse doctor” in the O.R. I think focusing on that would have made for a strong episode. The water shortage B Story is fine, nothing special. Of course Charles would find a way to survive during the shortage and of course it involve having his mother send him Vichy water. He’s lucky the water trucks made it through right after Hawkeye and B.J. stole his last bottle. Colonel Potter mentions a dry stream, suggesting the 4077th isn’t just suffering from a water shortage but an actual drought. Speaking of water, nobody talks about the camp water tower, the one that was knocked over in “They Call the Wind Korea” but the end of the episode, Klinger tells everyone the storage tank has finally been refilled. So does the 4077th have a water tower and a storage tank? I’m with Hawkeye. Creamed weenies are both inhumane and indecent. This was one of 12 episodes from Season 8 featuring a special “Also Starring” credit for Gary Burghoff in the opening credits. Sy Rosen? Do you mean Si Rose? That’d be interesting if he ever wrote for M*A*S*H.
It’s definitely Sy Rosen. Here‘s his IMDb profile. Okay. I’m not familiar with Sy Rosen (and I haven’t really seen any of the shows listed on IMDb) which is why I thought perhaps you meant Si Rose, who worked on shows like DUKES OF HAZZARD, McHALE’S NAVY, and wrote and executive produced many of Sid & Marty Kroffts’ shows. She hugged the stuffing out of me!! This is an OK episode whose only true funny portion is when Hawkeye and BJ confront Charles in the shower about his water usage. BJ: Methinks I smell a wet rat. Hawkeye: This towel is damp and it is not cream of terry cloth. The entire water shortage plot here doesn’t …hold water. Numerous episodes imply there is fresh water nearby – people go fishing, the local ladies do the camp laundry in a stream or river (numerous jokes about “oh, you got a new rock”), swimming is mentioned at least once, and at the start of this episode Hawkeye mentions taking someone “to the stream and beating you on a rock”. Since no mention is made of drinking water, apparently the only concern is water for bathing …why couldn’t they bathe in the stream/river/lake nearby? When you consider how much water a MASH unit would use – enough for the needs of approximately 200 people plus the necessities of a small clinic – does it make sense this could be provided by periodic visits from a water truck, or even several trucks? It is much more logical that the unit would be situated near a natural water supply, and not one in danger of drying up from a brief drought. I believe in one of the episodes dealing with bugouts it is mentioned that the new site should be near water. The storage tank would be the one on top of the tower, the water being gravity fed to the showers, kitchen, and hospital. The only episode where we see the tower/tank, that I recall, is where Hawkeye and BJ must give Potter’s horse an enema. BJ climbs the tower, which appears to be no more than 8-10ft tall, the tank perhaps 6ft tall and about as wide. This is not large enough to realistically supply the entire MASH for long, there is no evidence of other tanks, and it would be ridiculous for trucks to come by often enough to keep it filled. Bottom line, I think this episode takes great dramatic license for the sake of one simple, not very well thought, plot. Thing that didn’t make sense was when BJ and Hawk stole Charles bottle of Vichy water and then started pouring it over themselves into the ground. Why would they waste the only water in the area? Just seemed like a foolish and silly thing to do. Actually, yes, the MASH units were supplied by water trucks that ran back and forth all the time from a corps water depot. Water, nearly as important as electricity, was always a requirement in the operating tent. In addition to the problems of lack of water for personal use, mentioned in chapter 5 , the functioning of the hospital required an enormous amount of water. The problem was that water was not available in many of our locations. When we did manage to set up near a town or city that had a water system, the water production had usually been destroyed or contaminated by the war. As a result we had to provide our own water wherever we went. The MASH therefore had a water truck assigned to it as part of the organic equipment. It was kept in the motor pool and driven by our enlisted personnel. They had a simple but very important mission: keep the operating tent fully supplied with water. Our water truck made runs constantly to the nearest army water point—usually we received this kind of support from the closest combat division—to fill up and return with the water. The enlisted personnel emptied the water into field bladders or other equipment and returned to the combat division water point to get more. If the water point was not available, the drivers had to make the long haul to the nearest corps or field army water point. A plentiful water supply was absolutely mandatory. Hope Father Mulcahy wasn’t growing his corn at this point…Corn plants notoriously bogart any available water present in a garden. Father Mulcahy’s little monologue about how he’s disappointed that everyone calls him father was just naive, petty, and annoying. He must know they the reason they call him father is out of respect. He earned the title and should be proud of it. If he doesn’t want to be called that, why is he a priest? A few seconds later he tells Gail not to expect too much from him. Didn’t he realize that the father title is also to separate him a bit from mere men? It helps to avoid little scenes like he had with Gail. I can’t imagine a real priest dedicated to his calling worrying about little things like what people call him. He should have bigger fish to fry with so the dead and dying around. Hi, fellow MASHers! I need some help with a question, as I have only a passing familiarity with the Catholic church and no familiarity with military protocol, and I’m not quite sure where to ask this, I tried the internet, but it didn’t work out. I’m writing a fanfiction that’s a sequel to this episode where Mulcahy tries to decide if he should leave the priesthood to be with Gail. The setting is I’d say around the timeframe that season 10 in the series takes place, so he’s still in Korea, and she’s in Tokyo. My question is: if he decides to leave the church for love, would there be other consequences, besides the obvious defrockment? Would he be deployed back to Philly, as he is serving in Korea as a representative of the Catholic church, or would he stay there as a nondenominational chaplain, due to being currently in the employ of the U.S army? And since both Mulcahy and Gail are lieutenants in the army, would there disciplinary action due to a man and woman of equal rank getting into a relationship? If anyone with any familiarity with what would realistically happen in a situation like this reads this, I’d welcome any explanation as to what would occur. I’d be sure to give your username a shoutout when I post the fanfic! Thanks in advance! Jesus loves you! Ex-Catholic here. In the US, church authorities couldn’t stop him from quitting the priesthood, but they could certainly defrock him, and possibly excommunicate him. He would not be allowed to have a sacramental marriage in the church unless he was granted a dispensation, which was fairly rare pre-Vatican II. He could be banned from receiving any other sacraments, including Eucharist. I don’t know anything about the military, so I can’t help with your other questions. Thank you for your information, Belvedere Jehosaphat! I greatly appreciate it! I’ll definitely credit you in my fanfic! God bless!